American Journal of Cardiovascular and Thoracic Surgery (AJCTS) is an open access Journal which publishes articles to enlighten the society by providing scientific information related to Cardiaovascular and Thoracic surgery. The main goal of this Journal is to share recent information on clinical, experimental research and developments carried on the heart or blood vessels. Cardiovascular surgery is frequently performed on patients, who have ischemic heart disease like bypass grafting, congenital or valvular heart disease which occurs due to endocarditis, artherosclerosis, thrombosis and rheumatic diseases. Heart transplant is one of the major fields that are gaining wide importance under cardiovascular surgery. Cardiac transplant or heart transplant is treated in many peoples who have failed to respond to medical therapy. This Journal will give a detailed insight about the latest developments that are carried out in the field of cardiovascular surgery thus providing a guide to healthcare providers for the betterment of life. Journal accepts innovative articles with respect to heart valve repair, coronary artery bypass, aneurysm repair, revascularization, heart transplantation, valve replacement etc. 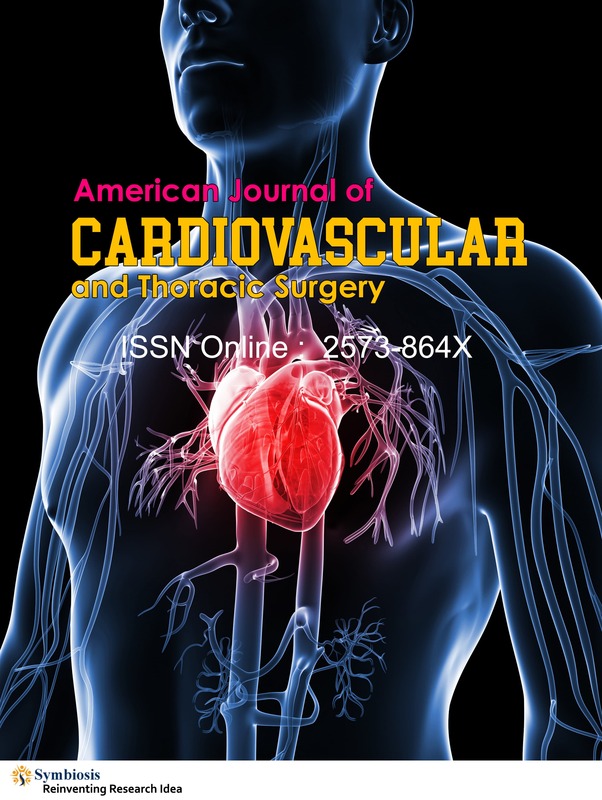 American Journal of Cardiovascular and Thoracic Surgery will help the society, readers, scientist, surgeons, students and medical practitioners to interchange knowledge and ideas about ongoing developments and research in the field of heart surgery. The Journal is highly privileged to present latest reports to the society regarding the four chambered organ that controls the whole body. American Journal of Cardiovascular and Thoracic Surgery welcomes exemplary research article to publish all facets of surgery on cardiovascular system. We accept articles that are related to latest surgical procedures and techniques, diagnosis, imaging, patient outcome, risks, reperfusion injury and drugs. We publish scholarly articles in the form of original research articles, case reports, mini reviews, review articles, short communications, editorials and opinion articles. We promise you that this Journal is a peer- reviewed international Journal which helps you to keep abreast with the recent clinical information and theoretical knowledge about the Cardiovascular and Thoracic surgery. Symbiosis open access Journal of Cardiovascular and Thoracic surgery will play as an indispensable instrument for cardiovascular surgeons and for the entire medical family. All the submitted articles will be thoroughly peer- reviewed before publication and the accepted articles with innovative scientific information will be published online.